The joy of yoga is that it is very simple and yet with regular practice it can transform the way we feel about ourselves and the way we live in the world. Helping us ‘grow happier’. I teach classical yoga which combines yoga postures, breathing practices, meditation and relaxation taking my inspiration from a number of respected yoga traditions including Satyananda, Iyengar, Sivananda, and Tibetan Bon yoga as taught by Tenzin Wangyal Rinpoche. 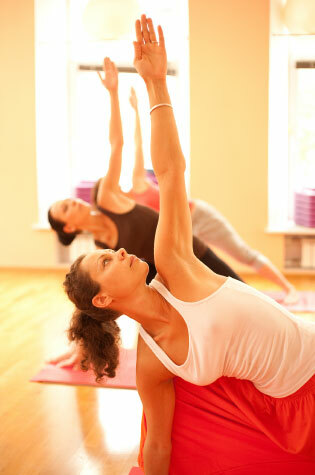 On a physical level yoga has been shown to improve flexibility, strength and posture and to enhance the immune system. Emotionally it teaches how to stay present in the moment and helps release long-held patterns of tension and stress, creating a deep sense of well-being. The Tuesday 11.45 a.m. class is gentle and suitable for beginners, for anyone recovering from injury or illness, and for anyone who just wants a really relaxing experience. The Tuesday and Thursday evenings are more dynamic and include a mix of floor work and standing flow with other traditional yoga practices such as pranayama, mindfulness and relaxation. They are mixed ability and I can accommodate beginners as well as more experienced practitioners. Location and costs of all classes are shown in the table below. You will need a yoga mat and blanket, but I am happy to lend you everything you need when you first start.